Quick + Thoughtful Valentine's "Truffles"
About that “chocolatey” thing, though—I come from a long line of women who prefer vanilla/caramel to chocolate. Plus I wanted to make a Valentine’s Day treat for those of you who don’t love a box of chocolates, so I decided to do vanilla and chocolate. Either flavor follows the same recipe and starts with store-bought cake. I really wanted this recipe to be as easy as possible and QUICK. I used store-bought sauces, but feel free to make your own caramel or fudge sauce for an even more special treat. Using a stand mixer will transform the cake and sauce into a cake truffle filling in a matter of minutes! Then I just scooped away! I used a 1-tablespoon portion scoop, but you could also just use a spoon. Each recipe makes 40 to 45 truffles! And then rolled the outsides in a combination of powdered sugar and cocoa powder (just straight cocoa was a little too intense and drying). You have a delicious treat that looks like a true truffle, but has the center of a cake pop! These can be enjoyed immediately, however, they are arguably better after being chilled. Darrick, My #1 Taste Tester, loved them! 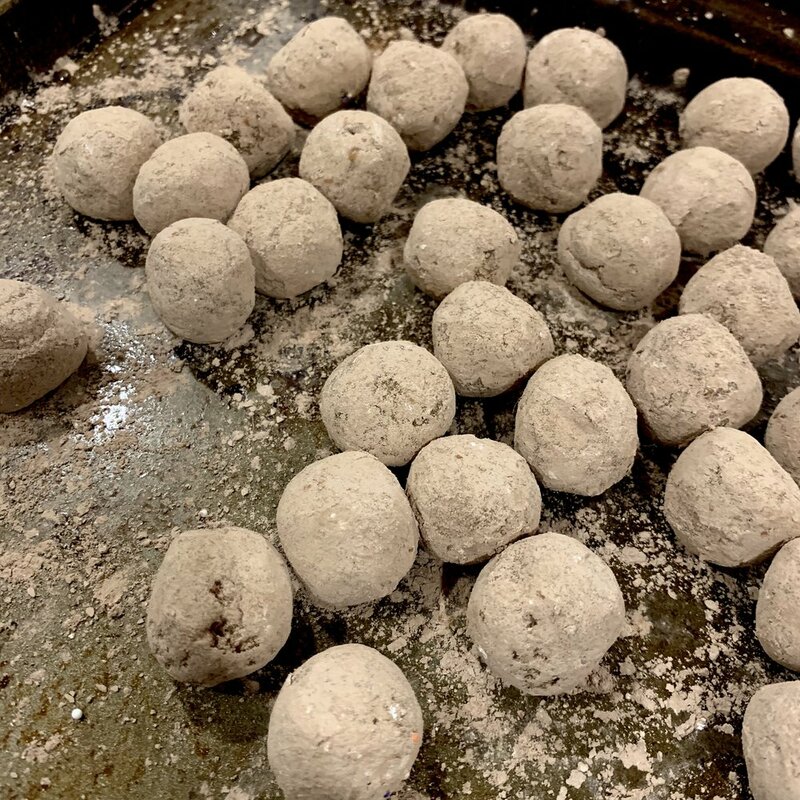 Soooooo, in 20 short minutes, you can make Valentine’s “truffles” for the special people in your life with little to no hassle, but all the thoughtfulness. I didn’t think it could be done, but I’m so glad I tried! This week’s challenge proved that you really can whip up something special in no time! makes: 40 to 45 "truffles"
Tear the cake into small pieces and add the pieces to the bowl of a stand mixer fitted with the paddle attachment. Add caramel, hot fudge, or jam sauce and mix until a tender, but stiff, dough is formed—about 2 to 3 minutes. Add the nonpareils or cocoa nibs (if desired), and mix again to combine. Using a one-tablespoon scoop, portion the dough, rolling each portion into a ball in your hands to make its outside smooth. In a medium bowl. combine the powdered sugar and cocoa. Roll each truffle in the mixture to coat its outside. Serve immediately or refrigerate in a sealed container for up to a week. Bourbon Truffles in a Naptime or Less!